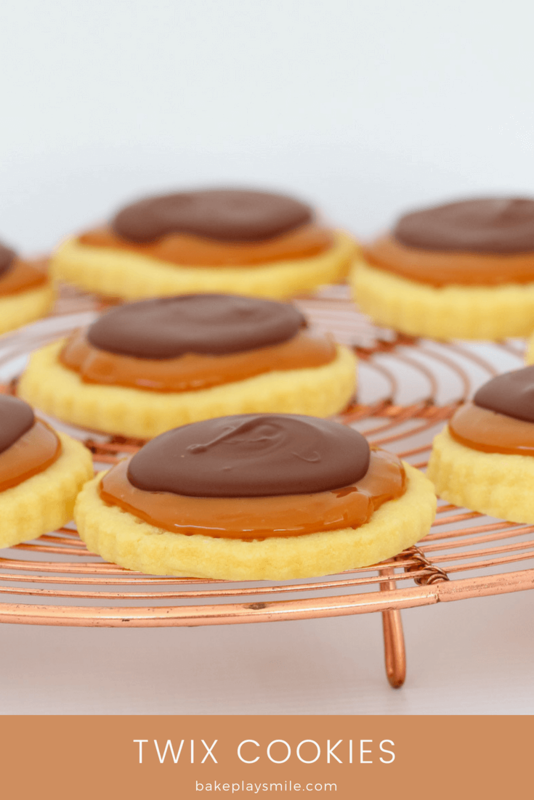 Our Twix Cookies are completely addictive! 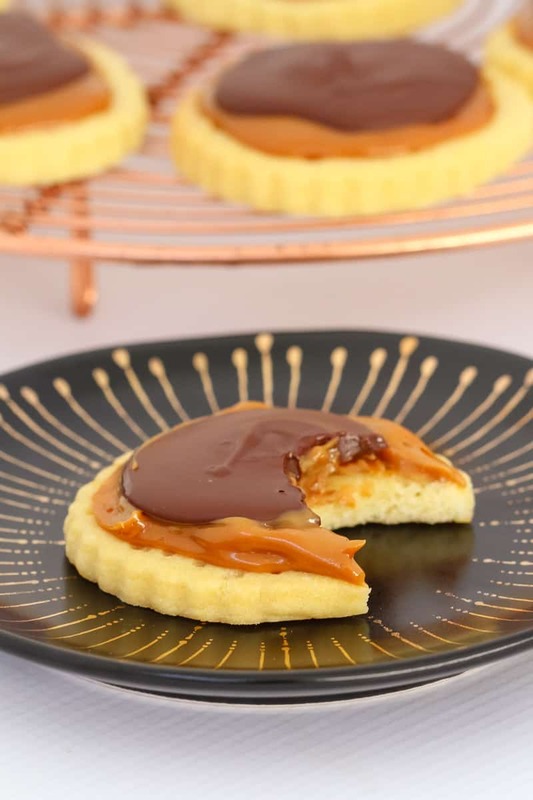 Made with a super easy shortbread base, caramel filling and dark chocolate topping… the perfect sweet treat! 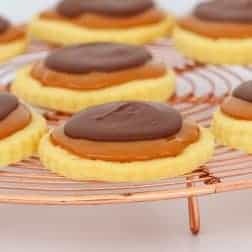 If you love Twix bars, then you’re going to fall head over heels in love with these homemade Twix Cookies! They taste just as good as the store-bought classic (maybe even better! ), they’re SO easy to whip up… and you only need 5 ingredients. Yep just 5! Prepare the shortbread base by beating the butter until smooth and creamy, beat through the icing sugar and then the plain flour (your mixture will be crumbly). Knead, roll and cut the dough into shapes. Bake the shortbread cookies (as per the recipe card and tips below). 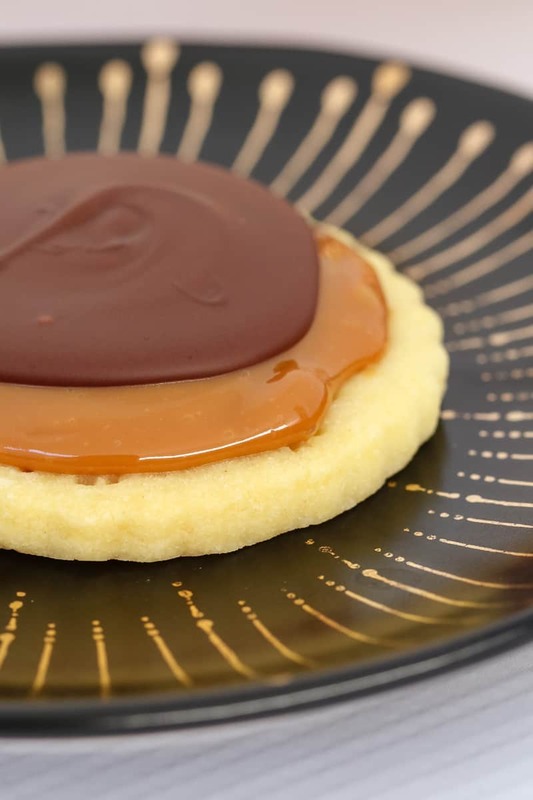 Once the shortbread cookies have cooled, spread over the thick caramel sauce and then spread over the melted chocolate layer. Allow to set. I used Nestle Caramel Top n Fill for my caramel layer. 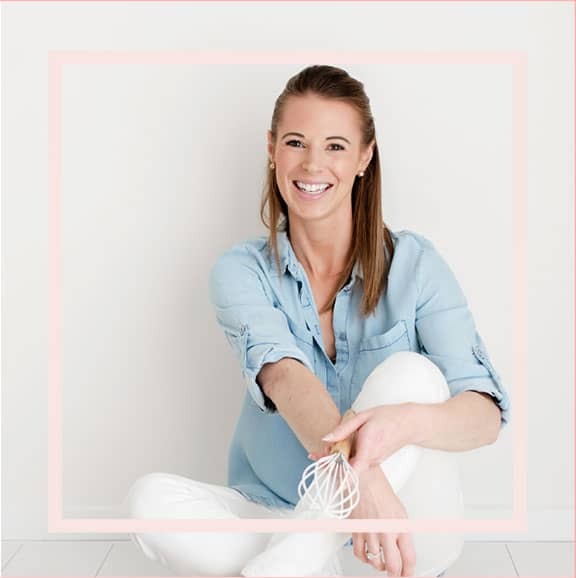 You can buy it from the baking section of most major supermarkets in Australia. Spoon the caramel into a bowl and mix with a spoon until smooth. If you can’t find Nestle Caramel Top n Fill, simply use any thick caramel (it needs to be very thick to hold it’s shape on the cookies). I like to use dark chocolate on top, but you can substitute for milk or white chocolate if you prefer. If you live in a cold climate, your chocolate layer will set at room temperature, however, if you’re in a warmer climate, you’ll need to place the cookies into the fridge until the chocolate layer has set. 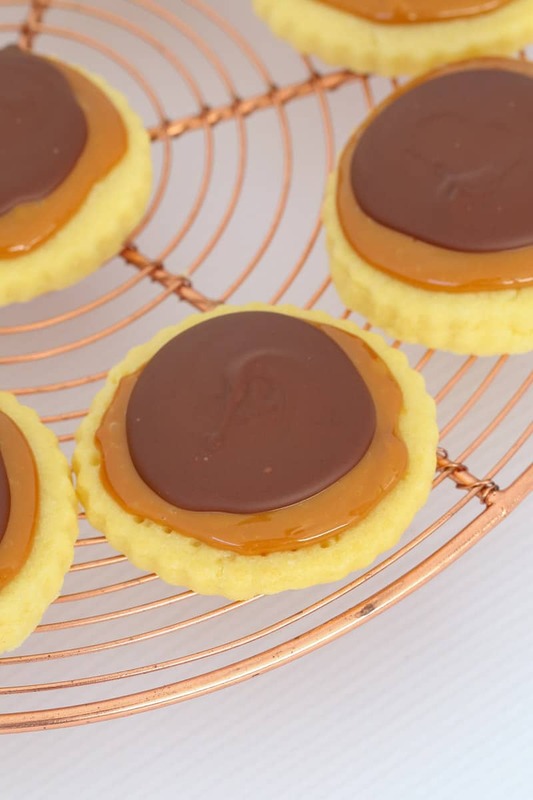 The shortbread layer in our Twix Cookies is made using the famous 3 ingredient shortbread recipe. 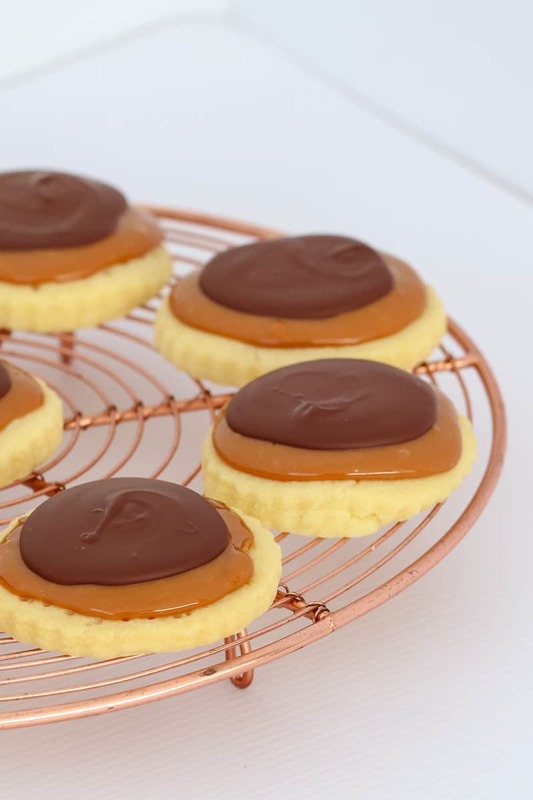 If you’d rather classic Twix shaped ‘logs’ instead of round cookies, you can prepare the shortbread as per the recipe below and then cut into long logs instead. And so there you have it! 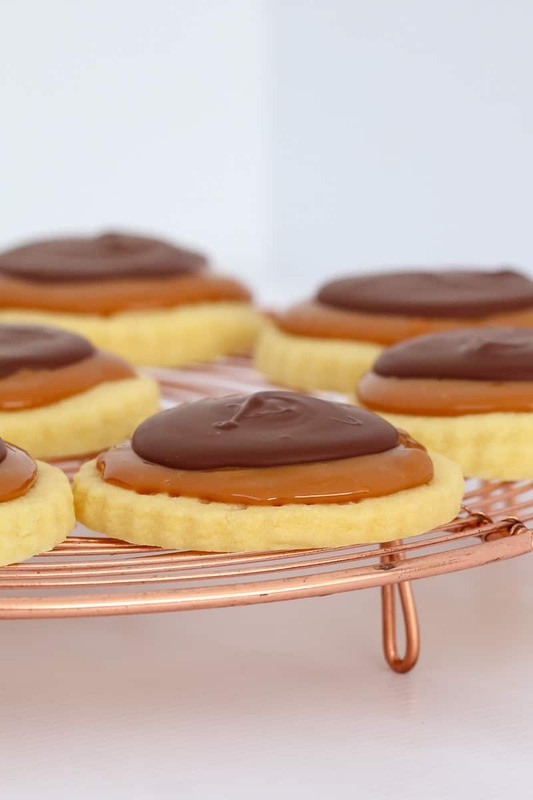 A super simple Twix Cookies recipe that will leave you drooling! Enjoy! Our Twix Cookies are completely addictive! 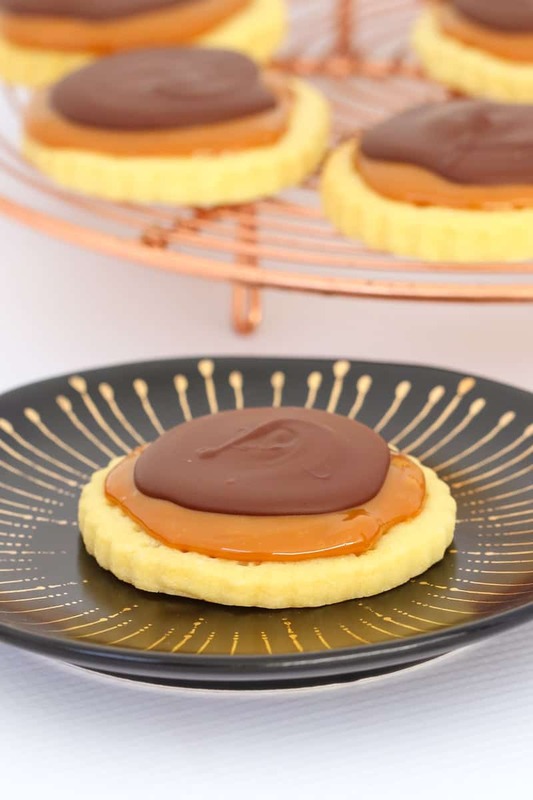 Made with a super easy shortbread base, caramel filling and dark chocolate topping... the perfect sweet treat! Preheat oven to 160 degrees celsius (fan-forced). Line two large flat baking trays with baking paper and set aside. Beat the butter in a large bowl using an electric mixer on medium until smooth (approximately 30 seconds). Slowly add the icing sugar and continue mixing until well combined. Scrape down the sides of the bowl. Add the flour and mix on low speed until combined (please note that the mixture will be crumbly at this stage). Gently knead the dough into a ball (but don't overwork it) and then roll out to 1/2 cm thick. Use a round cookie cutter to cut the dough shapes out. Place the shapes onto the prepared trays and bake for 12-15 minutes or until only just very lightly golden (do not overcook). Allow to cool on the trays for 10 minutes before transferring to a wire rack to cool completely. Place the Top N Fill into a small bowl and mix with a spoon until smooth. Spread a small amount of Caramel Top n Fill over the top of the cooled biscuits and then top with a small amount of dark chocolate. Place into an airtight container at room temperature for up to 5 days (see notes). Nestle Caramel Top N Fill is a very thick caramel that can be purchased from the baking section of most major supermarkets in Australia. 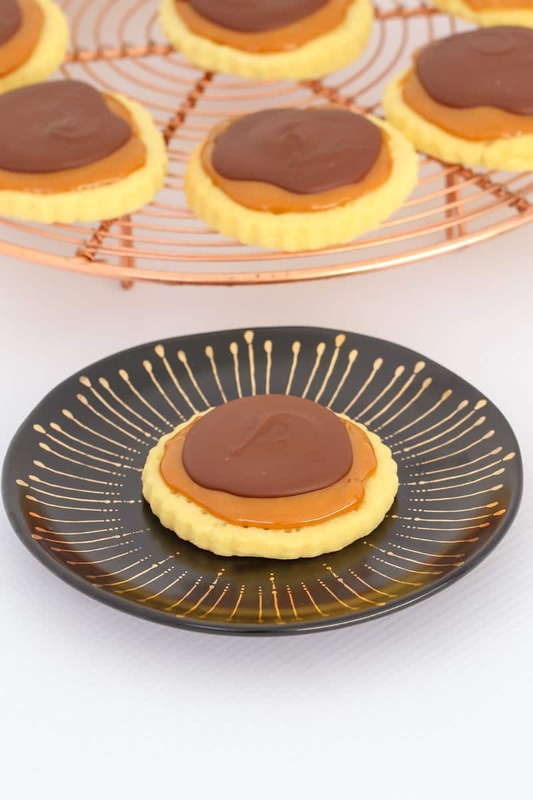 If you can't find this particular brand, you can substitute for another caramel (please note that it must be very thick to be able to hold it's shape on the cookie). I keep these biscuits in an airtight container at room temperature. If you live in a hot climate, you may need to store them in the fridge to allow the chocolate to set. Place the icing sugar into the Thermomix bowl and mix on Speed 8, 10 seconds. Scrape down the sides of the bowl and add the butter and plain flour. Mix on Speed 6, 10-15 seconds and then on Interval/Knead function for 1 minute. Just whipped up a double batch of the scrumptious morsels for the after school foodies! They will no doubt get rave reviews!